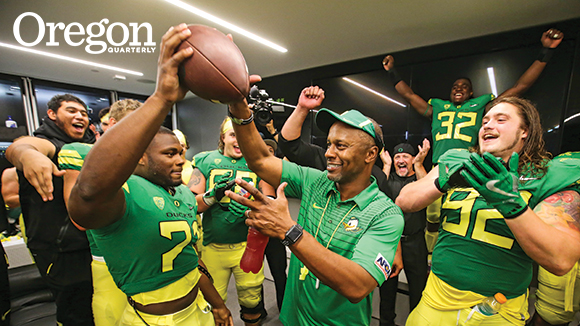 On a warm July afternoon, Willie Taggart sits in his new office at the University of Oregon, smiling back at the memories from his days growing up in Palmetto, Florida. The memories are as fresh as if the games that produced them took place days ago, rather than decades. Maybe they’re so vivid because they have to do with something Taggart loved as a kid: playing football with his neighborhood buddies. Willie and his friends played pickup football after school. No coaches, no parents, only fun. Sometimes, they improvised with a game called “Throw ’em Up, Bust ’em Up.” The football got tossed, and whoever grabbed it had eight guys to outmaneuver to the end zone. No blockers, no rules, just hard hits and long laughs. As they got older, they all wanted to take their game to powerful Manatee High School, including Taggart. He was a wispy 145 pounds—“as thin as the wind” was how some in Palmetto described him. But size didn’t keep Taggart from going after the prized job on the field—quarterback—or putting the lessons of “Throw ’em Up, Bust ’em Up” to good use. One play crystalized Taggart’s tenacity. 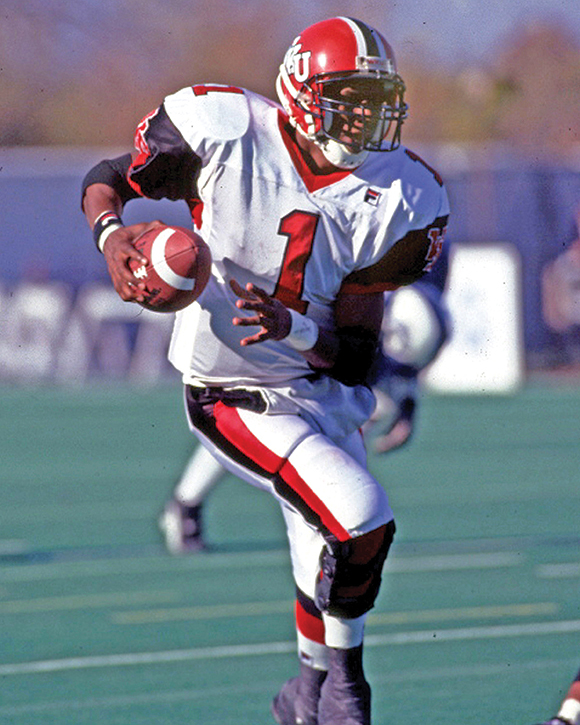 It came in his first-ever start as a high school quarterback on a fall night in 1991. After taking the snap from center, Taggart broke tackles. The goal line was in view, so he raced toward it . . . crossing it just as a defender collared him. As one teammate said later, “The guy threw Willie down like he was throwing a towel off his shoulder.” The hit didn’t faze Taggart—or at least he had learned not to show it. He bounced up and rushed to the sideline, where high-fives from teammates awaited him. The years have passed, and Taggart, now 41 and the new head coach of the University of Oregon Ducks, is 3,000 miles from the fields he played on, the friends he collected, and the sometimes-unkind streets he walked. He’s stockier, and specks of gray dot his hair and beard. But one thing is very much like 1991: Taggart has people believing in him—believing that he can make Oregon football a national power again. And why not? His résumé says he can turn programs around. He took down-and-out South Florida to bowl-eligible in three seasons. Before that, in 2010, he inherited a team at Western Kentucky University—his alma mater—with a 26-game losing streak, and guided the Hilltoppers to a winning record in two seasons. Relocating to Eugene, Taggart brought more than a smile and joie de vivre. He packed the lessons of 941, shorthand for his hometown (it’s Palmetto’s area code). Sure, he grew up “playing football, football, football.” But life in the town south of Tampa wasn’t always the thrill of Friday night lights. He also talks about less dazzling days. About weekends picking oranges with his mom and dad, both sharecroppers, to make extra money for the family. About “Christmases when I didn’t get anything. I woke up and I didn’t have toys or bikes that other kids had. That was disappointing.” And he talks about buddies he played with, some who would go on to big-time college careers and “to play on Sundays,” and some who wouldn’t. A long-term relationship was sealed. After Taggart graduated but failed to latch on with an NFL team, he accepted a job on Jack Harbaugh’s staff that launched his coaching career. There is a focus to Taggart’s work today. When he left Palmetto in 1994 for college, his goals included becoming the first in his family to graduate college (check); finding a wife (check—he married Taneshia Crosson in 1998 and they have three children); and getting drafted by the NFL so that he could buy his parents a new house (unchecked). As he recalls this list, he smiles, saying, essentially, two out of three ain’t bad. Now, as a college coach, he simply wants to win a Division I national championship. For his best shot, he’s traveled 3,000 miles from home. He’s arrived loaded with lessons learned a long time ago, a long way away. Charles Butler, an instructor in the School of Journalism and Communication, has written for the New York Times, Fortune, and Runner's World.